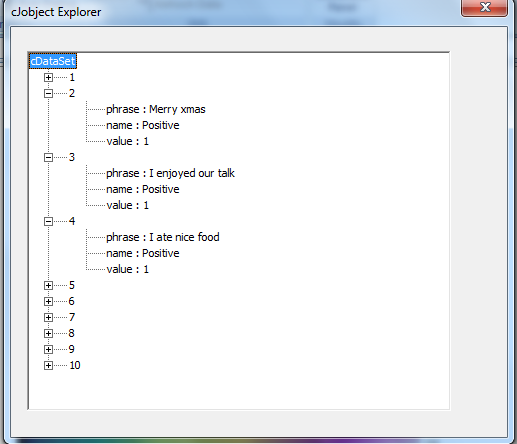 Since the cJobect is just a tree type structure, it is very simple to turn in into a treeview to display it on an Excel User Form. This means that anything on this site that has been represented as a cJobject can be turned into a treeview in one line of code. A treeview user control is normally on a form. Here is one that takes the Rest to Excel library and shows it on a form. The cRest library nowadays is itself kept as a cJobject, and can be retrived with the createRestLibrary() function. To create the form above, you simply have to create a user form, add a treeView control and execute this (where the name of your control is trcJobject. In Excel JSON conversion I covered how to convert a worksheet to a cJobject and serializing it in jSon. There are many examples of this kind of conversion on this site, and with the use Data Manipulation Classes a cJobject is simply a property of abstracted data. 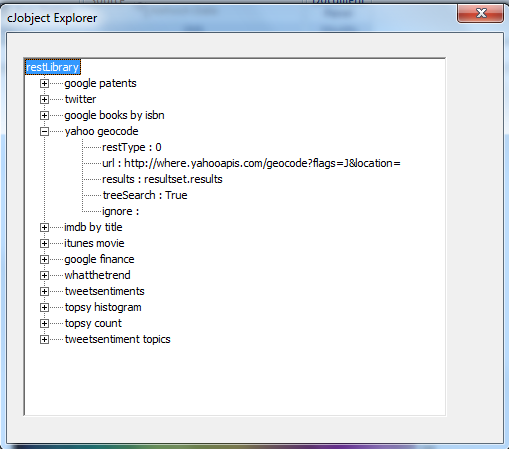 This means that anything that you can put in a cDataSet can be converted to a treeview in the same one line of code. This has been implemented in the cJobject class that can be found in the cDataSet.xlsm file from Download Complete Projects. Because the cJobject class is itself a tree, the conversion to a treeview control is beautifully simple and recursive as below. Why not join our forum,follow the blog or follow me on twitter to ensure you get updates when they are available.